For the past week I've had a sorry looking head of cauliflower sitting at the back of my fridge. When I brought it home from the market it was bright white and full of possibilities, but it was growing little brown mottled patches and I needed a recipe idea, pronto. Luckily someone on Twitter mentioned eating some roasted cauliflower with parmesan. Ah ha!! A plan was hatched. 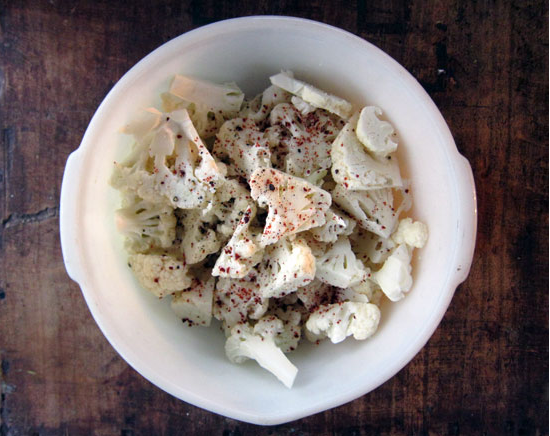 Luckily, it was a very simple recipe that yielded some seriously delicious cauliflower. First, I sliced off any off-colour bits then chopped my little friend into manageable slices, tossing it with a bit of olive oil, lemon juice, aleppo pepper and salt before throwing it in the oven. Once it was brown and caramelized on one side, I flipped the roast-toasty cauliflower pieces over and grated a good amount of Parmesan over top. Parmesan is key! A bit more oven time, and dinner is served. That's right, I ate a whole head of cauliflower for dinner. Weird I know, but laziness over took me and the end result was much more fantastic than I was expecting. 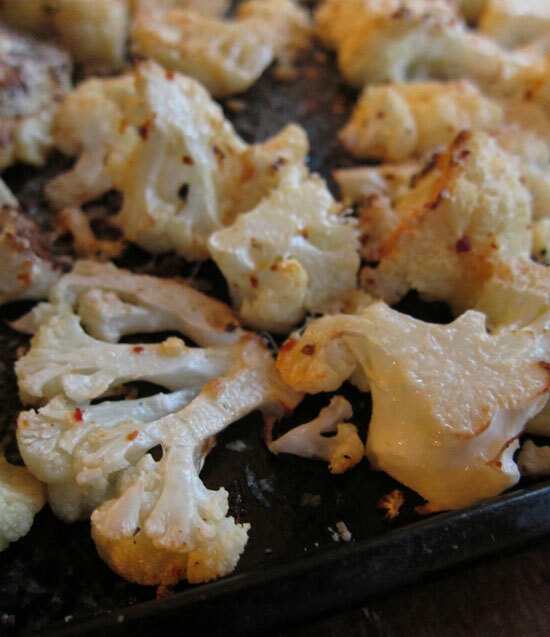 Roasted this way, the cauliflower is rich and nutty with a nice helping of cheese. I think even cauliflower haters will enjoy this dish. Serve this with a green salad and a bit of protein...or just scarf it down before you can even think about anything else. I kept it simple here, but garlic would also be a good addition. 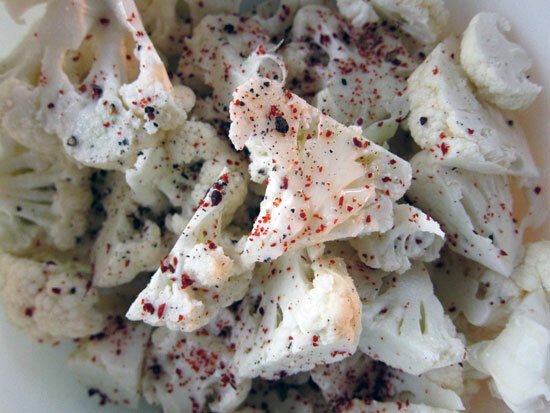 In a large bowl, use your hands to toss cauliflower slices with oil, lemon, pepper and salt. Place evenly on a baking sheet and bake for 10-15 minutes or until brown on one side. 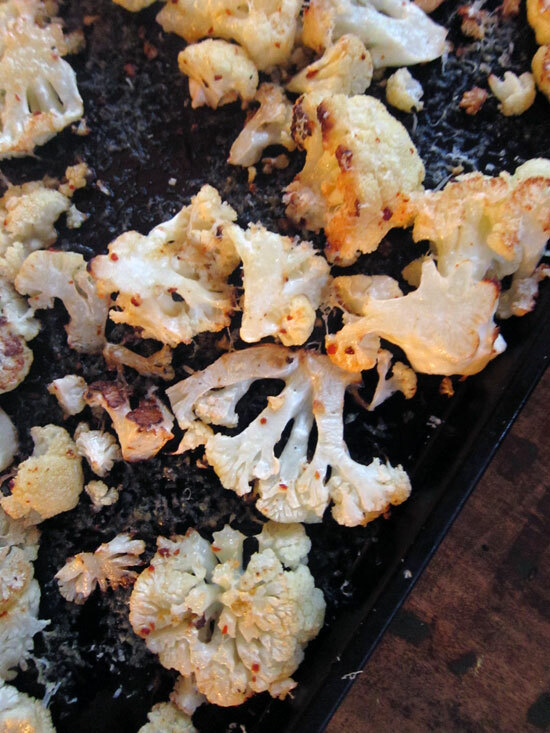 Flip cauliflower and sprinkle with a good amount of Parmesan cheese, return to the oven to bake for another 10 minutes. Remove from oven and eat up.